If you're going to settle in and play lose yourself in the worlds of Red Dead Redemption 2 or Fortnite, you might as well do so on an Incredible version of Microsofts Xbox One X. See what we did there? Yeah okay, subtlety isn't our strong suit. Bad puns aside, you do have a chance to win yourself a stylish custom Xbox One X console decked out with an Incredibles 2 skin. 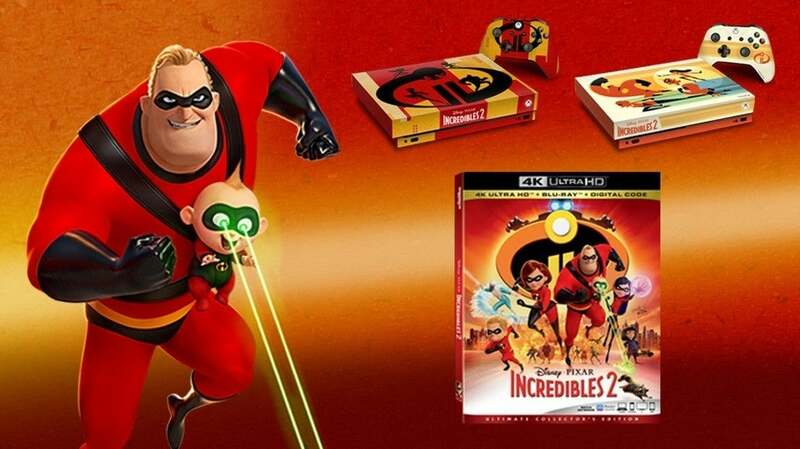 There are two designs in the mix, with the first featuring a red and gold color scheme with the Incredibles 2 logo emblazoned on the top and featuring a controller with a similar design. The second console features the family front and center as they dash off to save the world, and features a white and orange color scheme and a controller to go along with it. regardless of which version of the console you win, you'll get a 4K Ultra HD copy of Incredibles 2 to enjoy on it, and all you have to do is enter right here for your chance to win. It's also important to note that simply winning the contest will not grant your child powerful abilities like phasing through walls or turning into a human fireball, but it will make your entertainment unit look quite stylish while you play your favorite game, and really, that's what it is all about right? You can check out the console in the image above, and make sure to enter the contest right here! As for Incredibles 2, you can find out more about the film below. Written and directed by Brad Bird ('Iron Giant,' 'The Incredibles,' 'Ratatouille') and produced by John Walker ('The Incredibles,' 'Tomorrowland') and Nicole Grindle ('Sanjay's Super Team' short, 'Toy Story 3' associate producer)." "In 'Incredibles 2,' Helen (voice of Holly Hunter) is called on to lead a campaign to bring Supers back, while Bob (voice of Craig T. Nelson) navigates the day-to-day heroics of "normal" life at home with Violet (voice of Sarah Vowell), Dash (voice of Huck Milner) and baby Jack-Jack — whose superpowers are about to be discovered. Their mission is derailed, however, when a new villain emerges with a brilliant and dangerous plot that threatens everything. But the Parrs don't shy away from a challenge, especially with Frozone (voice of Samuel L. Jackson) by their side. That's what makes this family so Incredible." Which Incredibles console do you like better? Let us know in the comments!